This System Is a Combination of Every Type of Creative Deal Structuring and Creative Financing Options Available to Every Investor Regardless of Their Own Credit or Financial Situation. With This System Having to Get Bank Financing Will Be a Thing of the Past. It Contains Multiple Deal Structures to Help Even the Most Novice Investor Be Able to Structure a Creative Deal Other Investors Will Walk Away From Simply Because They Won’t See the Same Opportunities as the Trained Eye of the Owner of This System. Negotiating from a Position of Power by Knowing the Seller’s Personality Type. The “4” Questions Every Investor Needs the Answers to Before making an Offer to Buy. The Key Items You MUST Know and Do to Protect Yourself from Unscrupulous Contractors Taking Advantage of You and Your Checkbook. What to Look for and How to Secure the Best High Profit Properties. How to get YOUR Phone Ringing Off the Hook with Motivated Sellers. Proven Letters to Property Owners. Detailed Repair Checklists that Will Prevent You From Under Estimating Repair Costs. Multiple Ways to Create Your Real Estate Wealth TAX FREE. “4” laminated “Quick Study” template’s that make YOU an Instant Expert. How to pick out the Money Maker Deals at lightning speed. How to create Massive Profits on Seller Financed Deals You’ve Never Owned. How to quickly Pre-screen Sellers-Eliminate the Time and Money wasters. The 7 Essential Buying Formulas that Maximize Your Profits and keep you safe from doing a bad deal. The 7 Strategies to buy All of the Houses You Want Using Seller Financing Even if You Have No Credit, Bad Credit, or don’t want to use your Good Credit. The Complete MILLION DOLLAR step-by-step buying procedures. Structure multiple offers for CASH IN A FLASH and LONG TERM WEALTH. Buying and Selling Contracts and Forms designed to protect you as well as put CASH in your pocket. With How to Filled out Examples – with multiple clauses to keep you Safe! How to sell houses In a Flash by making them easy for your buyers to buy. This Will Be The Solution to the Problem Of Getting Affordable Financing to Fund Your Deals And Set You Apart From the Rest. This Information Will Put You On the Fast-Track of Building Your Real Estate Wealth and Lifestyle. The following are a list of benefits Seller Financing can give not only the seller of the property but also you, the buyer. Seller Financing Benefits You Can Count On! Investors Are Finding It Impossible to Get Institutional Financing Today. Never be Humiliated Filling Out a Loan Application Just to Be Later Turned Down. You Will Have A Distinct Advantage Over Other Real Estate Investors In Your Area. You Will Be Able to Buy Real Estate Even If You Are Bankrupt. You Don’t Need Money or Good Credit to Buy Real Estate. You Have the Ability to Create Huge Future Discounts If You Get Seller Financing Terms. No More Credit Checks. Most Sellers Don’t Belong to A Credit Bureau. Quick Closings and Low Closing Costs. You Can Use Seller Financing Terms to Get Quick Cash. The Correct Wording in Your Paperwork Will Give You Non-Recourse Financing. You Can Have Multiple Loans In Your Name But Not Show on Your Credit Report. The Seller Can Get What They Want Without Bank Approval. You and the Seller Set the Rules, Not the Bank. You Can Know What the Seller Is Thinking Before They Say A Word. You Can Overcome Almost Any Objections Before the Seller Has a Chance to Say a Word. Seller Financing Deals Make Perfect Wholesale/Flip Deals. You Can Get Long Term Income or Fast Cash – Whichever You Prefer. You Will Be Able to Do More Deals With Less Money. Seller Financing Deals Do Not Require Seasoning. There Are No Points or Loan Fees Ever Again. You Can Structure Creative Deals – By Using What You Want to Get What You Want. Being Creative You Can Make More Profit Per Deal. You Can Create Huge Profits Without Having Property Ownership. If You Get Better Terms = Greater Profit. This Is Creative Information Your Competition Doesn’t Know. It’s All Done with Non-Threatening Easy to Use Paperwork. Never Be Forced to Step Into a Bank Again! I have purchased 2 of his programs. I find them to be thoroughly well organized and focused. The information is on target and to the point. He simplifies complex and intimidating concepts. His use of flow charts, gives you an overall picture of how to structure your business for the best asset protection using Land Trusts. His Creative Seller Financing program is nothing short of brilliant. I wished I had thought of some of the things that Larry is teaching me in this series. His approach to sellers is compassionate, but highly business saavy. I will be using his “cheat sheets” for a while until I get so comfortable with the information that it becomes second nature to me. I appreciate his availability to entertain my numerous questions. His answers guide me and allay my fears. So, don’t hesitate to invest in yourself and his programs. It will be the best investment you will ever make. Thank you Larry Harbolt for sharing your knowledge and wisdom. I am a BIG FAN! This Information Will Allow You to Never Be Forced to Step Into a Bank Again! 98% of ALL Real Estate Investors Will Be Denied Bank Financing This Year! Getting Bank financing this year for real estate investors is no longer a reality. If you haven’t noticed the real estate investing has had a major make-over, and not for the better. What this means for the real estate investor is affordable financing to buy houses just isn’t going to be in the cards for them. Do you think you will be lucky and actually get a loan from a bank if you were to apply for one? Are you still making offers to buy houses contingent on getting some type of financing never knowing if you can or not? The worst thing I see everywhere I go are investors believing they will be able to make their deals work and get the money they need to complete their transactions when I know it isn’t going to happen. Investors Are Finding It Impossible to Get Institutional Financing Today. How do investors plan to pay for the properties they buy when it is impossible to get institutional financing? Unless investors have a friend with lots of money who is willing to fund the investor’s deals, all investors will slowly go broke. Not a pleasant thought is it? Here’s the problem… Some investors are going to use Hard-Money loans or some type of a bridge loan to finance their deals and this is wonderful, provided the deal can endure the costs of the loans and still be able to give the investor a profit. For most investors using these types of loans just isn’t going to cut the mustard. Let me ask you, are you lose sleep at night worrying about how you will be able to pay your bills every month? Are you worried that you might lose everything you’ve worked so hard to acquire from years of hard work? Have you heard the stories about other investors going broke simply because they are unable to close on the properties they are buying just because they don’t have access to the funds they needed? It’s a simple fact there are hundreds of thousands of real estate investor across the country this year that won’t be in the business next year! Are you going to be one of them? Do You Have a Plan How You Will Find Funding? Do you currently have a plan how you will fund your deals this year or haven’t you worried about it yet? If you haven’t its time you did and the time is now! There is a solution to this problem. The solution I am talking about is what real estate investors have done to finance their deals for hundreds of years and today that very strategy is what smart investors will be using when everything they were previously doing no longer works. 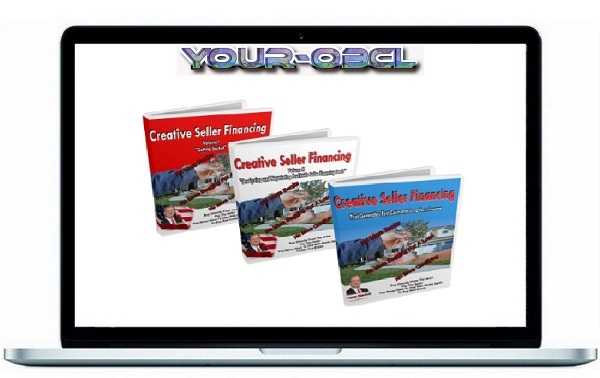 The solution to the problem of not being able to get affordable financing to fund the deals you do is available to you in Larry Harbolt’s Creative Seller Financing course. This course explains in simple detail how to structure your deals and get the seller to accept payments from you or the person you will be selling the property to. Using seller financing has been used for hundreds of years successfully and today it is quickly becoming the financing of choice for those trying to sell their property quickly or those who want a continual income stream for many years to come. Because of the easy availability of getting institutional financing most investors haven’t heard of seller financing and don’t know how to implement it. Larry has personally used seller financing to fund his deals for over 30 years and continues to use it today and you should too. Currently there are less than 20% of all of the houses in this country in some form of foreclosure or bank owned after a foreclosure has taken place. But did you know that, 30% to 40% of all of the houses in this country are FREE & CLEAR with no debt. Let me ask you a question… do you think it is easier to fund a deal where more is owed for the property than it is currently worth, in foreclosure or already foreclosed and gone back to the bank after the foreclosure. Let me tell you from experience, the only way to pay for these properties is by either paying ALL CASH or getting financing to buy the properties. When you find a property that is free and clear the owner can make a deal you can easily do without having to pay all cash or having to get an institutional loan. Many sellers who have free and clear properties don’t want all of their money at one time because of having to recapture all of the depreciation they claimed on their income tax return over the years they owned the property as well as all of the capital gains from the profit from the sale, both in the year of the sale then take what little money they have left and put it into a savings account or bank CD’s at 3/4% to 1%. This is not the best use of their money.